Remember that line from Patrick Swayze in Dirty Dancing?! It’s the part where Johnny returns to do the final dance with Baby, even after he’s been fired from the resort. 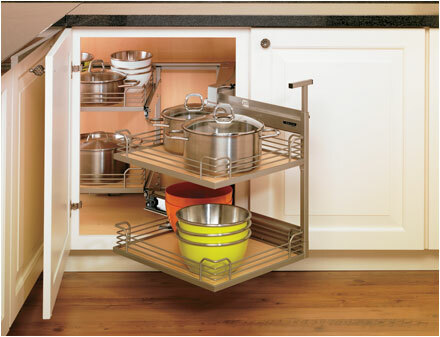 Maybe “nobody puts Baby in the corner,” but in a kitchen, the corners can be one of the toughest places to get functional storage. So what do you put in the corner? Anybody have one of those “blind” cabinets where the cabinets sort of overlap at the intersection, and you can’t even see/reach in the back of it? Yea. Not that. 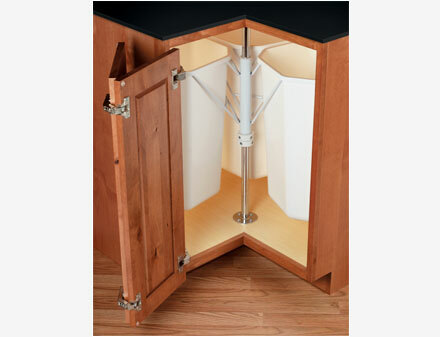 One option is to get a cabinet with mechanisms in it that you can pull out. Sometimes the whole tray angles and pulls out so you are really bringing the stored items out to you. Or, in this instance, the front racks slide out and pivot to a 90 degree open position, and the back rack slides forward. Have you seen this before? We can get a cabinet where there is a stack of drawers in the corner! 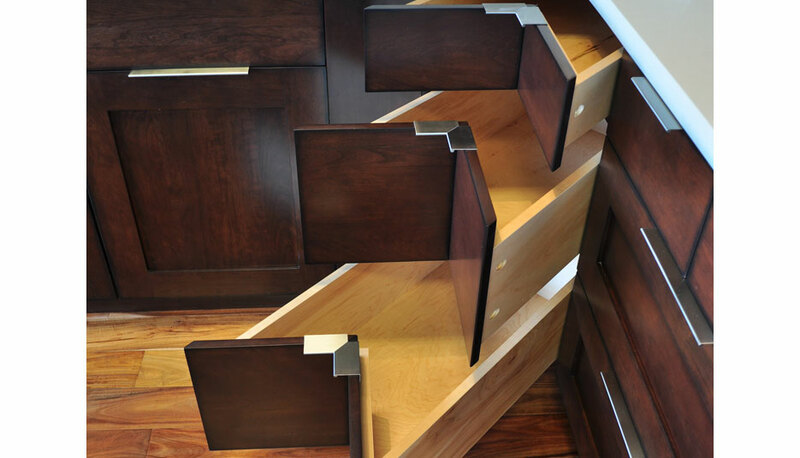 The drawers themselves come out at a 45 degree angle from the rest of the bottom cabinets. This one really fools your eye when it’s tucked in, so it might trick any first time helpers or guests in the kitchen when you send them for the ladle. This is a fun one. Putting a rotating recycling bin in the corner makes it easy to pre-sort the recyclables before taking them out. Each bin easily comes off the rotator when necessary, but is sturdy enough to fill up. Having it here makes it much more convenient than walking to the bin in the garage every time you need to recycle something. Plus, there’s the added benefit of not having to look at the recyclables piling up on the countertop waiting to go out. This is my favorite, because it just makes life so easy. This is a Super Susan, the much-better-looking-sister of the Lazy Susan. Notice the lack of the support pole in the center- this one sits (and spins) independently on its own shelf! Then, it locks in place on its own ball bearing. This allows you to not only load it up with heavier items than the “lazy” version can handle, but it also means you can fit larger items in there too. 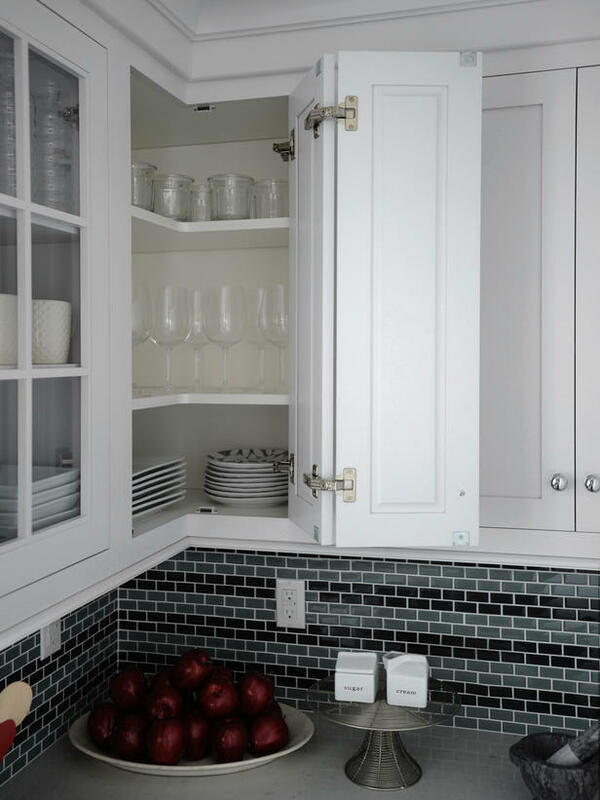 Getting into the corner wall cabinets is slightly less difficult than retrieving items from a bottom corner cabinet, but can still be frustrating if you’re living with one of the “blind” cabinets previously mentioned. This cabinet forms a right angle, and the doors are hinged together to open as one. 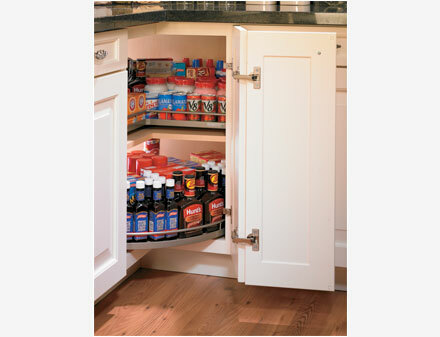 That way, when you open the doors, you can see…and reach!… items in the whole cabinet. So, there you have it- just a couple great options for your kitchen corners that don’t involve Jennifer Grey. Maybe you weren’t “Having the Time of [Your] Life” like the final dance scene in the movie, but that’s it for this post!